A brilliant, realistic look at the future of space exploration and the fate that awaits humans among the stars, Aurora is the best book I’ve ever read from Kim Stanley Robinson. It’s also the best book I’ve read so far this year. Stand alone or series: Standalone novel. Why did I read this book: The intriguingly vague and epic-sounding premise; the promise that this new book by Kim Stanley Robinson (whose books I enjoy very much) was unlike anything he had ever written before; the gorgeous, sparse cover art! I was hooked at first sight. In the year 2545, a starship crafted by human hands began its voyage from the Solar System to nearby star, Tau Ceti, just 14 light years away. Moving at 1/10th the speed of light for most of its journey, the ship’s voyage has lasted nearly 160 years when Aurora‘s narrative begins–just 10 years away from arriving at the eponymous moon that may serve as a new home for humanity. During its long life, Ship has seen fifteen thousand humans (and even more animals, and many, many more bacterial and microbrial life forms) live and die in its rings, spires, and biomes. And now, Ship has begun the calculations and deceleration pattern that will bring it and the thousands of lives aboard to the Tau Ceti system, in the hopes that one of the planets or moons in the star’s habitable zone can host life. There’s Aurora, the crew’s best possible shot–a water world and Earth analog, with the right composition, mass, and likelihood of supporting Terran organisms. Things have started to go wrong, though, aboard the generation ship itself–and Aurora is not what it seems. Soon, the human explorers born among the stars will face their greatest obstacle, and the first real choice they’ve ever had to make as a group. Aurora is the latest novel from multiple award-winner Kim Stanley Robinson, and it is one that retreads familiar space–the generation ship, traveling from Earth with the fragile hopes of finding a new, habitable home in the stars; the challenges posed by generations of humans and Earth organisms born and living in space after so many years of traveling; an AI that develops a personality; the intrepid leader who unites her people in their indecision and fear. Yes, these may be classic tenets of the space exploration canon, but fear not, fellow traveler and science fiction fan–Aurora is like no other generation ship book you’ve ever read. A brilliant, realistic look at the future of space exploration and the fate that awaits humans among the stars, Aurora is the best book I’ve ever read from Kim Stanley Robinson. It’s also the best book I’ve read so far this year. I’ve been thinking long and hard about what it is that makes Aurora so successful a tale–is it the blend of hard science fiction physics and biology? The compelling and original narrative structure, coupled with truly unexpected plot developments? The social and ethical questions posed by the narrative regarding space travel and the humans sent to colonize the stars? The legacy of a great leader and her daughter’s struggles to live up to her mother’s expectations? The evolution of Ship itself over two centuries of consciousness? The answer, of course, is that it is all of these things in a perfect, delicate balance–a calibration of which Ship itself would approve (and a goal to which Ship itself would need to dedicate its entire processing power). From the very first page, Aurora succeeds, excels, as a story because of its unexpected narrative in both structure and substance. It begins as a kind of assignment, 159 years into the voyage. Over the years, the human lives aboard ship have been organized not in the tradition sense of having a captain, a first mate, and all the other associated ranks of command. Rather, Ship is broken into different biomes, modules that replicate the diverse ecologies and biologies of Earth–tundra, prairie grasslands, rainforest, boreal forests, freshwater lakes, deserts, and the like. Each biome is named for its Terran counterpart (there is a Costa Rica, a Mongolia, a Nova Scotia, and so on). For the most part, people can travel between biomes and wander the ship, although relatively few choose this life of wandering–although two very important people to this narrative have done so. Aurora‘s main protagonist is a woman named Freya–at the time the narrative begins, Freya is just 14 years old, and following her mother Devi around the ship as Devi deals with problem after problem. So, while the ship has no commander or chief engineer, Devi is the de facto leader of this mission. Brilliant, able to predict and sidestep some of the logical fallacies and assumptions humans are apt to make, Devi is the reason why the ship is running so well, so late into its voyage. She identifies the myriad problems and their possible implications in the ship’s forever-closed system; she worries and obsesses and is so very angry (though most people can’t tell–Freya is very good at tuning into people’s feelings, though). Devi is also the reason why Ship is aware and creating a narrative–it is Devi who, in her younger years, started talking to Ship and worked on developing its artificial intelligence from a great quantum computer to something, possibly, more. It is Devi who tells Ship to build a narrative of the journey, because she knows her time is short and that her people will need Ship’s help to survive whatever happens when they reach Tau Ceti and make landfall on Aurora. And so Ship, after studying the appropriate queries and literature, focuses its narrative on Freya–Ship’s mother was Devi, too, so Freya becomes a natural focus of its attention. Freya knows that she is not her mother; she lacks her mother’s brilliant, glittering intellect and Devi’s ability to see the whole picture. In fact, Freya isn’t good with numbers or equations or science at all–but she is methodical, and deeply perceptive when it comes to empathy and other people. Like her mother, Freya chooses to wander the ship in her younger years, living with different people in different biomes, making new friends as she travels. (This becomes very important later, when every soul aboard the ship must choose how they will deal with their collective future.) The tension between Freya and the legacy of her mother, the great Devi, is a defining characteristic of Aurora, of Freya’s character, and Ship’s narrative–when the bad times come, Freya, her father Badim, and many others ask themselves “What would Devi do?” At every major point in her life, ever leadership moment, every watershed decision, Freya channels this question and does what she thinks is right–what she knows her mother would have chosen for the best possible survival of her people. Ship’s narrative is also very clever in the manner that it divulges and withholds information. Aurora is a “hard” science fiction novel that offers plenty of meat in the biological and computational problems associated with space travel–because this is an AI, learning to tell a story, its asides into the problems of island biogeography and genetic diversity, complicated maneuvers around or composition of interstellar bodies, computational decision-making problems, are not info-dumpy or misplaced. They are naturally ingrained in the narrative–and if ship ever gets too far off course, there are humans to bring it back to the main thread of the story. (Another refrain from both Devi and Freya: “Get to the point!”) Suffice it to say that the science in the book is fascinating–the exploration of 200 years in space without the lifeline of Earth has its profound effect on the people, animals, and organisms aboard ship. These effects begin to take their toll when Devi is alive, and her greatest fears are realized just a few short decades later. I refuse to divulge any spoilers–and I highly, highly recommend that anyone interested in reading this book refrain from looking at spoilers–but something very dramatic happens in the early half of the book that changes the trajectory of this voyage forever, and the goal of the narrative. I love that the official description of this book is intentionally vague–and it would do you, fellow readers, a disservice to spoil what happens to Ship and the lives aboard it when they get to Tau Ceti (or the thing that has happened in decades past, or that lies in the decades to come). Which brings me to my next point, and the two most important reasons that Aurora is such a powerful and memorable book: the active questioning of the ethics of sending a generation ship on such a journey into space, and the character of such a self-aware spaceship itself. I would like to assert a hypothesis (no doubt a generalization that Devi and Ship would find hugely flawed): most science fiction fans who choose to pick up a story about a generation ship and its arrival at a distant, Earth analog world, want to read the story of humanity settling at that world. We want to read the struggles faced by the humans aboard the generation ship, we want to understand the consequences of over a century of living in simulated 1.1g without sufficient biodiversity, we want to watch the spectacle of these humans who have never set foot on Earth or any other planet make their triumphant, hard-fought way on their new home. Here at this moment, Aurora roared, howled, boomed, shrieked, whistled. One of the explorers was bowled over, crawled around, got onto hands and knees, then stood up, carefully balancing, facing intot he wind and stepping back quickly four or five times, swinging arms, ducking forward to hold position. They were all laughing. Aurora is and is not that story. The quote from Konstantin Tsiolkovsky, that notion that Earth is the cradle of humanity but one cannot stay in the cradle forever, is a central lifeline at the heart of any exploration in space–it’s the mentality that launched ship to Tau Ceti over a century before the book officially starts. It is also the underlying assumption that Aurora unequivocally, relentlessly challenges with every page. Ultimately, it’s a question of choice. Devi is so angry for so much of her life because she never had the choice to board a tin can–brilliant as it may be–and set off for the stars. Freya, and Badim, and Jochi, and Euan, all of these lives and the near 2000 souls who are aboard ship as it reaches Tau Ceti never were asked what they wanted, but had the choice made for them by one of their ambitious, exploration-hungry ancestors. 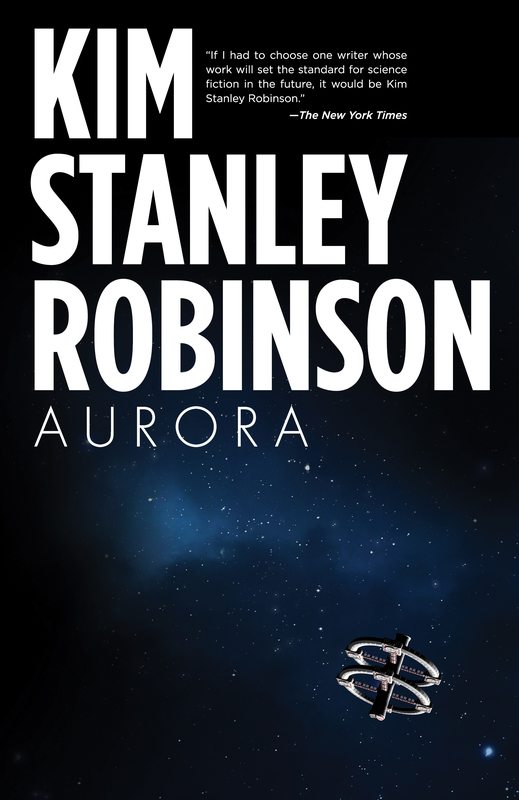 Robinson’s argument with Aurora–so markedly different from his other books–is that there is a great human cost associated with exploration, and that space is hostile to human life. It reminds me of an accurate quote from Star Trek‘s Bones McCoy: “Space is disease and danger wrapped in darkness and silence.” It is. Realistically, at this point in time, with the knowledge we have of the universe, it is. Colonization is hard, even impossible in space because other worlds are either dead and hostile rocks that will take thousands of years to terraform (presuming it is possible at all), or they are alive with their own invasive forms of life, which are almost certainly incompatible or hostile with humanity. A solution to the Fermi Paradox, if you will. Other intelligences or life may have the ability to travel to the stars, but it’s a farce–because the type of life supported by one world will not be compatible with another. Aurora almost reads as a mea culpa for space colonization optimism, for getting caught up in the idea of something without considering the human cost. It’s a different, bold perspective that makes all the sense in the world, whether or not you agree with the sentiment. We think now that love is a kind of giving of attention. It is usually attention given to some other consciousness, but not always; the attention can be to something unconscious, even inanimate. But the attention seems often to be called out by a fellow consciousness. Something about it compels attention, and rewards attention. That attention is what we call love. Finally, last but certainly not least, the reason why Aurora stands out in this reader’s mind, is because of the ship itself. The starship that was once called Pauline by Devi, but refers to itself as Ship (and with the royal We), is not only the narrator and guide of much of this book, but its own evolution over the course of its centuries of life is the great achievement of exploration and humanity in Aurora. At times frustrating, at times funny, but always, always insightful, Ship is the gatekeeper of information and the caretaker of so many lives as it makes its way through space. It learns, it grows, it changes. How much did I care about Ship? I legitimately teared up at the end, as Ship begins its glorious last run, its final calculations as it travels an impossible path. We had our meaning, we were the starship that came back, that got its people home. That got some fraction of its people home alive. It was a joy to serve. It was a joy to read, too. Aurora is a brilliant book. It is a challenging book. It is one that I savored, that I devoted all my attention towards, that I loved with every fiber of my being. It is one of the best books of science fiction I’ve read, and the best book I’ve read all year. Notable Quotes/Parts: Read a preview online HERE (via Goodreads). And check out the video from Kim Stanley Robinson and Orbit on the book for more information! Rating: 10 – Perfect; and the first 10 I’ve given all year. Paul, Tammy–you are very welcome! I hope you love Aurora as much as I did 🙂 I can’t wait to read your thoughts! It got a perfect score! I picked this up a couple weeks ago; I’m looking forward even more to reading it now. I finished reading it last week myself and I enjoyed it very much. In my mind Ship is the main protagonist of the story. What he does with Ship, how he works it into the structure of the novel is one of the most important reasons why it is a brilliant piece of science fiction. On first reading I didn’t find Aurora be Stanley Robinson’s best work. I’m not sure why, but the time span over which it occurs perhaps caused him to move past certain things more quickly than I would have liked. There was so much scope to really dig deeper into the vast complexities of the mission that seem to have been missed. Perhaps the story would have been better served for the author to re-visit his earlier trilogy habit. I think a story of this grand scale really needs at least three books to explore properly. I will go back and re-read it (probably several times) so maybe my opinion will change. Im going to read it this week. Thanks for nice review!!!!! !